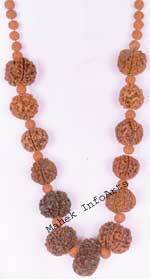 Mahalakshmi Rudraksh Beads: 1 Thirteen Mukhi, 1 Nine Mukhi, 1 Seven Mukhi rudraksh and 4 Lotus seeds in Red thread. 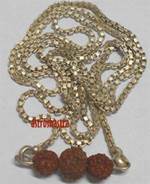 Description of Mahalakshmi Rudraksha Pendant : Mahalakshmi pendant bless the wearer with money, power and all his worries and difficulties are washed away by Goddess Lakshmi blessings. Those who wear this pendant with specific wish in their mind, that wish is always fulfilled. Whether one is Businessmen, in service, shop owners, this pendant is an excellent tool to attract the blessings of Goddess Lakshmi. 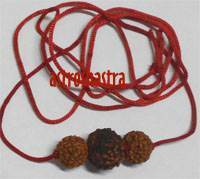 Ma Lakshmi wears Lotus seeds Mala therefore wearing Lotus seeds along with thirteen Mukhi rudraksh is very beneficial for obtaining blessing of Goddess Lakshmi. 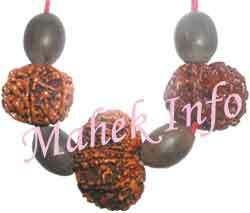 Nine mukhi represent the nine forms of Shakti to protect the wearer from all sorts of dangers. 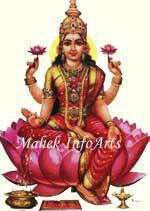 Each and every person on earth needs the blessing of Goddess Lakshmi and Mahalakshmi Pendant is one of the best ways to get Goddess Lakshmi Blessings. 3. Protect the wearer from any sorts of dangers. Pendant Wearing Mantra : "Om Hreem Shreem Kleem Aiem"